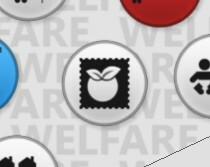 “Food stamps are teh evil, because they merely paper over the cracks caused by low wages and a regressive tax system. They patronize the poor in the manner of soup kitchens, rather than providing them with worthwhile jobs”. I just can’t decide. I’m in the UK, where we don’t have this policy, and I’m not used to hearing the debate. What do you think? 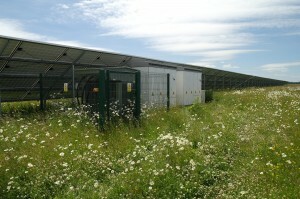 As I have blogged before, one of my hobbies and interests is the magical wonders of solar power. 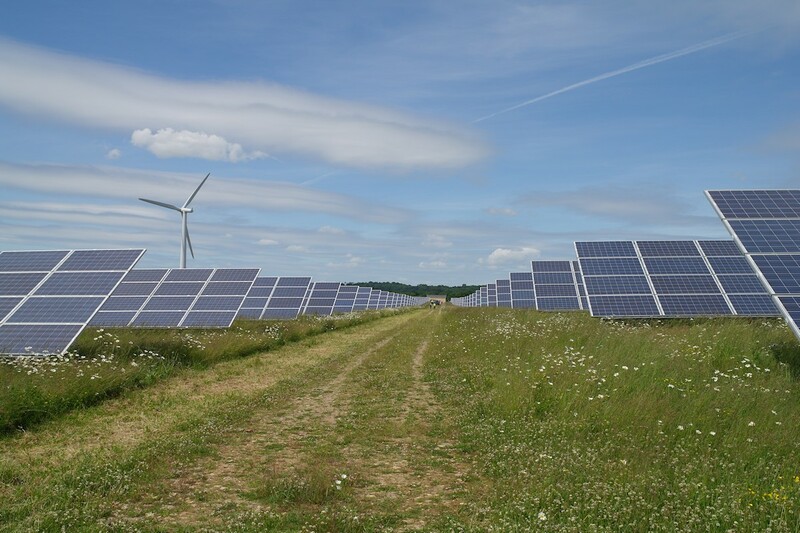 Because I put my money where my mouth is, I bought a share in a solar farm rather than stick the money in a bank account for evil banks to invest in landmines and tobacco. Today was the solar farms AGM, so I went along to check on *my* panels. 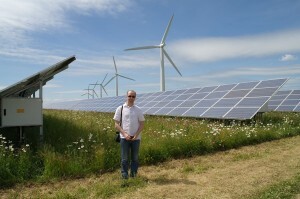 Me posing by some of the panels. We guessed about 200 are *mine*. 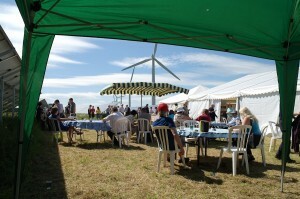 Tea and scones in the shadow of a wind farm, with subtle live music. 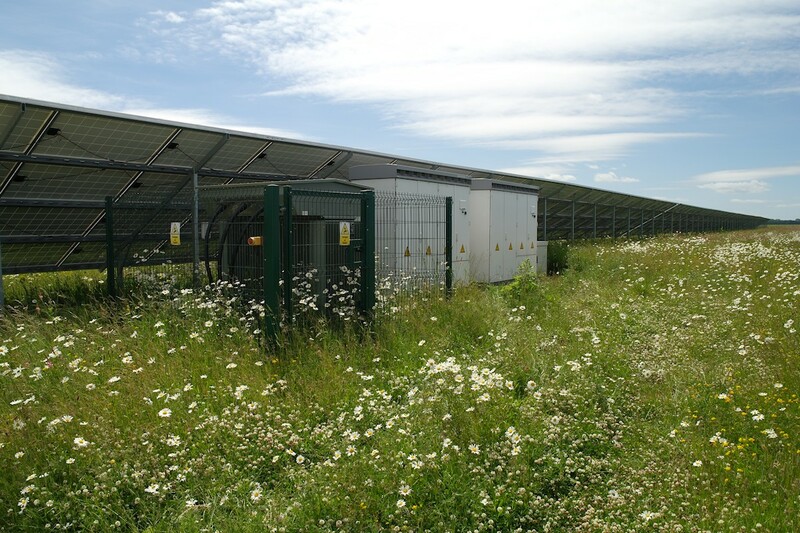 These mini-substation buildings were behind every 4th row, with big phat cables running into them. It”s amazing the extent to which your finely honed and perfect game completely falls to pieces when you introduce more than one level isn’t it? 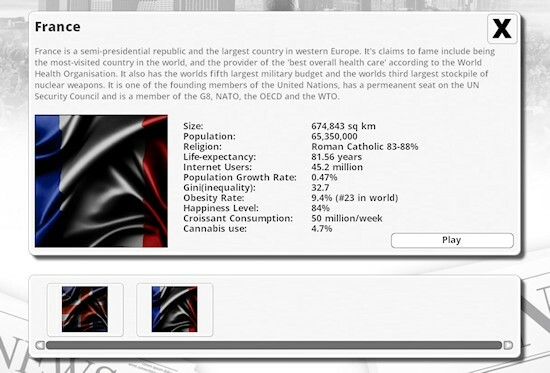 I’ve just been adding France as a playable nation to Democracy 3. French people are generally more likely to strike. They have less farmers and and less patriotic than the UK. they also have less smokers. They have a boost to tourism, compared to the UK. 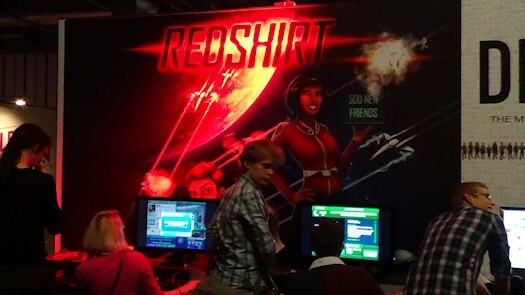 But enough about Birmingham, what about the games show known as rezzed? And despite our initial very English doom-and-gloom panic that we were the only strategy game in a sea of call of duty, and nobody would care, our booth was kinda swamped right from the start. It was *very* rare to find a moment of either of the two days where all 4 seats were not taken, sometimes with a small crowd around each player. 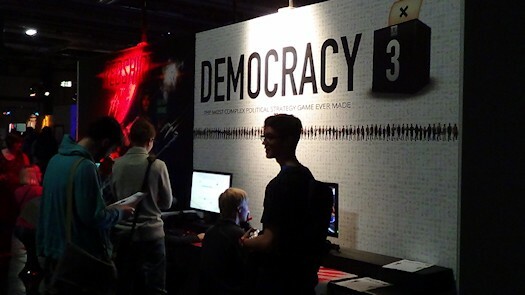 Redshirt was a big attraction, and democracy 3 seemed to attract all kinds of gamers, young,old,male,female, which was very interesting. As well as showing off the games, and getting to watch people play them, we also got to talk to a fair few people from the press, and of course hang out with a bunch of indies we know from previous events. I was busy enough that I only got to attend one of the developer sessions, which I guess is the downside of actually being an exhibitor. We had three people on our booth including me, and maybe we should have had more to free us up to actually walk around, or more importantly, sit down now and then! We completely ran out of badges, and almost ran out of flyers for both games. People really like game show swag! So anyway… the big question is, was it worth it, and would I do it again? I think the answer is ‘probably yes’. These things are expensive. yes it’s cool that you meet real gamers who play your games, but the gamers are charged for entering the show, and you get charged for providing the games they come to see…seems a little cunning to me. I am in the wrong business clearly… I think if the costs of exhibiting were much higher I’d say it isn’t worth it, given the opportunity cost that the money could also buy a lot of advertising or artwork/promotion in other ways. 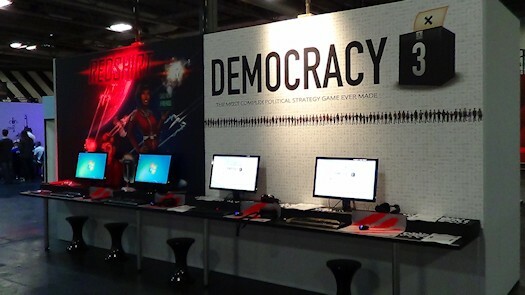 I’m pretty sure I’ve already mentioned it, but I’ll be Rezzed in Birmingham UK this weekend with Mitu from the Tiniest Shark showing off our games Democracy 3 and Redshirt. (I’m the publisher of redshirt, mitu is the developer). Right, that’s the sales pitch over with, so lets get to the more human interest honest heart-on-wrist stuff shall we? PLEASE COME AND PLAY MY GAMES! 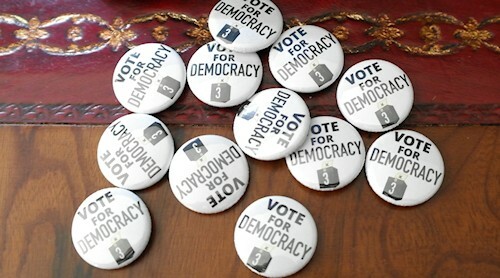 I’ve worked for ages in this little bubble where I *think* democracy 3 is fun and looks good and is playable and intuitive and makes sense, but like all developers I really have *no idea at all* what gamers who haven’t played democracy 1 or 2 will think of it. It is VERY valuable for me to know peoples opinions. I’ll give you nice glossy flyers explaining the theme of the game, and badges! and mitu has stickers as well as two yes TWO different types of badge for redshirt. How are you not already buying a ticket at this news??? Anyway, in all seriousness, come say hello, try the games, and tell us what you think. Don’t feel bad if you have criticisms or complaints about them. All feedback is good. I’m told I am ‘less scary’ in real life than online by people who meet me. I have *NEVER* done a games show in my entire career, so this is a big scary ‘argh will it be worth it’ moment for me (these booths are EXPENSIVE), and I want to squeeze it to get as much helpful feedback as possible. And if you write a blog, or do lets plays, or whatever, please introduce yourself. We are very happy to talk about the game, be interviewed and so on right there at the show. I might even give you one of my legendary business cards.